Interstate 70 is more than 2,000 miles long and runs from Baltimore to the middle of Utah. The mountain corridor of the highway runs through western Colorado and reaches 11,158 feet. Residents and tourists use the windy stretch of road to reach nearly a dozen ski resorts. It's construction, completed in 1992, is recognized as an engineering masterpiece. I-70 drivers slice through the mountains via the Eisenhower Tunnel, the highest point of the Interstate Highway System. You have to learn everything about Colorado chain law passenger vehicles too. However, many commuters do no revel at the mastery of this historic stretch of roadway, they despise it. Traffic congestion, accidents, and bad weather has made I-70 a contentious topic for locals. However, some government resources and situational smarts allow for a smoother ride. 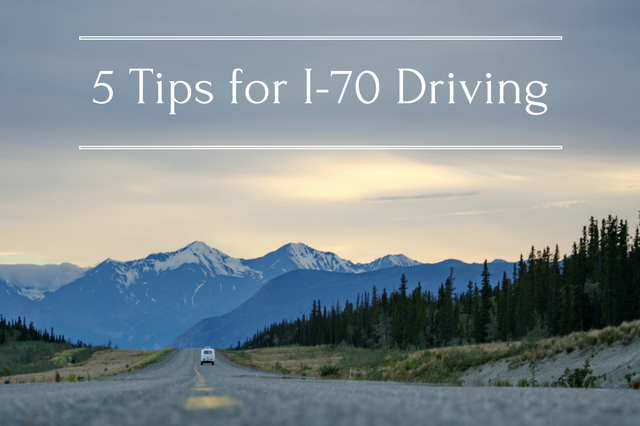 Here are five tips for I-70 mountain travel. We all love the feeling of taking off on a Friday and heading directly to a snowy mountain resort. Which is why everyone else has the same plan. A fundamental tip for avoiding traffic on I-70 is to avoid peak travel times such as heading eastbound during rush hour on Friday or Saturday morning. The I-70 Coalition, a partnership between 28 local governments have put together goi70.com - which takes the guess work out of predicting travel times. Check the travel forecast for updated westbound and eastbound predictions from Friday through Sunday. The site uses historical data and factors in weather, construction, and public events. Need an incentive to change up your plans? The coalition has created a list of deals for those who stick around on Sunday. Unpredictable weather and a thriving snowsport industry means avoiding peak travel times isn't always enough. The Colorado Department of Transportation (CDOT) website, COtrip, has you covered for real time info. It provides an interactive map with live camera feeds, average speeds, construction areas, and more. Enter your route and get a report with all the details you need before taking off. Go further by signing up for email or text alerts from CDOT. Or call 511 at anytime to learn about the current state of Colorado mountain driving. Less than two years after launch, 20 percent of global Uber rides derive from uberPool, the carpool spin off the popular ride-hailing app. The market for convenient carpooling has been proven and is expected to grow. Carpooling fits in naturally for I-70 travelers, they're usually heading to one of the various Colorado ski resorts. CDOT recommends SkiCarpool as a reliable source for finding a carpool crew. There's also waytogo.org which connects drivers looking to carpool or vanpool. The service is designed for home-to-work commutes but allows you to search I-70 trips as well. Facebook and Meetup are also useful for finding fellow drivers. There are two important laws to note in relation to I-70 mountain travel: The Traction Law and the Passenger Vehicle Chain Law. CDOT enacts these laws when conditions warrant them. The Traction Law requires either snow tires, mud/snow tires or a 4WD/AWD vehicle. A one-eighth inch of tread is required for all tires. The Passenger Vehicle Chain Law requires tire chains or a traction device. It's reserved for serious conditions when the roadway is in danger of closing down. The SMS/email alerts noted above alert drivers when these laws are in effect. Highway signage will display Code 15 for the Traction Law and Code 16 for the Vehicle Chain Law. Ignoring these laws can result in hefty fines: More than $130 for inadequate equipment and more than $650 for blocking the roadway due to equipment complications. Even the most skilled drivers should still be prepared for emergency situations. The Red Cross recommends items like a flashlight, battery-powered radio, first-aid kit, food and water supplies, etc. Keep some rock salt or kitty litter in your vehicle in case the tires can't get traction or you get stranded. Other essentials like a shovel, blankets, jumper cables and ice scraper will be useful if something happens and can be part of your vehicle winterizing kit. Learn everything about Colorado chain law passenger vehicles. Being prepared is ultimately your best bet when it comes to mountain travel and bad weather. If you're a new driver, consider training classes from the Western Slope Driving Institute. In addition to drivers education and traffic school, WSDI offers performance and awareness training which teaches evasive maneuvers and defensive driving skills. As former police officers, WSDI's instructors use their experience to help drivers understand how to drive safely. They provide a range of classroom instruction, online courses and behind the wheel training. Check out their courses today.